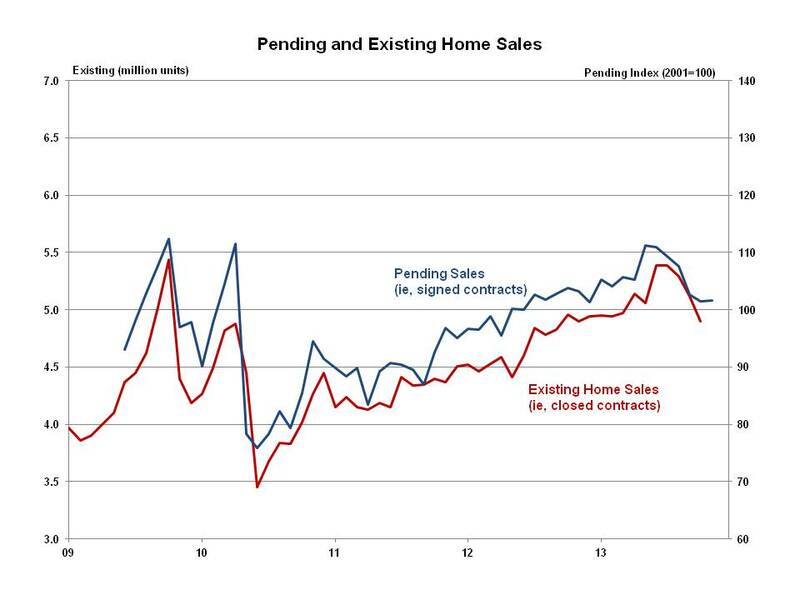 The Pending Home Sales Index (PHSI), a forward-looking indicator based on signed contracts, ticked up 0.2% in November to 101.7 from a downwardly revised 101.5 in October. The November 2013 PHSI reported by the National Association of Realtors (NAR) was 1.6% lower than the same period a year ago. The November PHSI increased 2.3% and 1.8% from October in the South and West respectively, but fell 2.7% and 3.1% in the Northeast and Midwest. Year-over-year, the November PHSI increased 1.9% in the Northeast and less than one percent in the Midwest and South; the November PHSI fell 8.7% from the previous year in the West. With the PHSI essentially flat at the end of the year, it is expected that existing home sales will remain roughly level at least during the first few months of 2014. After a surge in sales reacting to the late summer increase in interest rates, potential buyers have recognized that these modestly higher rates still represent very favorable home buying conditions. These new data suggest that after this brief period of fluctuation, the long-term trend is one of a stable level of sales. Over the long run, economic and housing data continue to describe a modest recovery for housing that will lead to higher levels of construction activity in the years ahead. While recent information illustrates that there will be ups and downs along the way, demographic growth and pent-up demand will support housing recovery going forward.